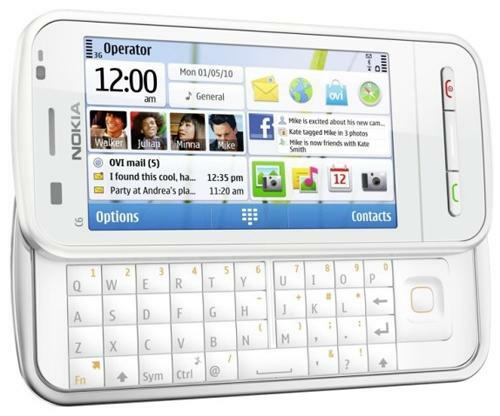 The slider QWERTY keyboard set up and the silver surface casting feels the Nokia C6 similar to Nokia N97. The C6 handset is commanded by the processor of ARM 11 4334MHz with the Ram of 128 MB. The 3.2” TFT touch screen of C6 helps to make comfort reading in 640 x 360 pixel resolutions and it supports 16 million colors to enhance the clarity. This S60 Smartphone, which names C6, is with the 16:9 image ratios in its display together with the resistive touch screen type. The display is much praised as the availability of features like proximity sensor and accelerometer. The proximity sensor helps to auto turn off and the accelerometer sensor to auto rotate. Though the 3G set C6 is tried to overcome on the hitches of previously launched two handsets, C6 still missing a much of the innovative qualities which it possesses. This entry level Nokia touchscreen is purposely for business and it seems lower than the N97 mini level. It supports the markup languages like HTML, XHTML MP, WML, CSS with HTTP v1.1, WAP protocols. Look here for full nokia c6 specifications. The Quad band GSM -850/ 900/ 1800/ 1900 supports the 2G network feature of C6 and the quad band HSDPA 850/ 900/ 1900/ 2100 in the 3G network of C6. The Symbian S60 5th Edition operating system of C6 makes the different in this new Nokia Smartphone from other S60 OS running mobiles with its features of messaging and social networking. The Nokia messaging services are supporting the C6 connectivity features. It is good news to Face book freaks that C6 ensures a favorable feature to for the direct access to the face book from your mob. The C6 connectivity helps you to managing around 10 email accounts. It supports the services of Gmail, Hotmail, Yahoo, and Windows live mail Ovi. Nokia C6 maintains the class 32 GPRS and EDGE together. Moreover, it is fairly approachable to data transferring in a limit. If you can use it with the Bluetooth v2.0 with A2DP you can transfer the data very the proficiently. The C6 handset is also compatible to the MicroUSD v2.0. The HSDPA support of C6 performs appreciated speed in browsing with the 7.2 mbps downloading speed. The other advantages of the C6 features helps you to keep in memory of last one month phone call record. It helps you to clarify your billings of the network providers. Along with its great internal memory, the microSD card of 2 GB is further expandable up to 16 GB. Yeah, here is little to talk about the entertainment factors of Nokia C6 as it provides features like Stereo FM radio with RDS and the efficient Music player of MP3, WAV, WMA and eAAC+ format music. The brand Nokia holds its popular traits like auto focus smile detection, face detection and LED flash in the C6’s 5 MP camera. For the video calls the phone offers the second QVGA shooter. The video capture is of 640 x 480 maximum resolutions at 30 fps available in the C6. The battery charger is following the old model of 2mm charger connector apart from the recent trends of Nokia which allows Micro-USB to charge the battery. And this 1200 mAh battery life gives a talk time of 7 hours and standby of 17 days. Smartphone helps me to navigate smoothly. The ‘Lifetime Walk & Drive’ navigation is the one which makes easy to get the place where I wanted to go for my last interview. The Ovi Store brings a trouble-free and fast way to download usable software applications which we want and along with the thousands of games and video apps. Obviously, Nokia C6 is an exciting new Smartphone launch with a lot of possibilities of messaging to a broad audience. It should be particularly a quick mobile. It runs you in a different world of Smartphone experience with a great number of messaging. Buying Non-Branded Ink Cartridges Any Good?